Looking at the 2014 Beijing Auto Show anyone could have announced it to be the largest automakers market. Series of concepts and production models made their debut including, Lexus NX, MKX Concept or the one from Mercedes. In line to same BMW shared its view for future designs through its all new BMW Vision Future Luxury Concept 2014. The Concept narrates use of light-weight materials and claims space and technology together. 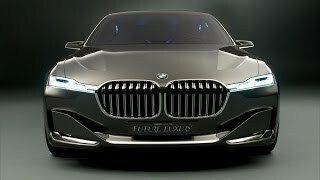 Let us have a look at the review of BMW Vision Future Luxury Concept 2014 to know more about it. 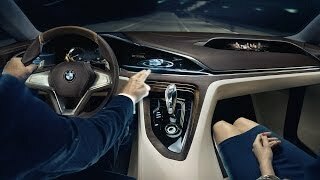 Interior of BMW Vision Future Luxury Concept 2014 is all covered with high-end leather and wood marking their presence over carbon-fiber and aluminum sheets. Starting with the dashboard, you have almost a button free console spreading from driver till the passenger; yes we mean dashboard comes with a three inter-meshing cluster of displays. The clusters thus make you center console and dashboard look clean, spacious and classic with its looks, however everything that can be operated through the display cluster waits for your voice command as well. This not only makes the cabin look awesome but also makes it futuristic. Further the passenger side of dashboard offers you a separate information display featuring command over center display without any hurdles. Marching towards the rear compartment you have two more displays surrounded with carbon allowing you the access over front screens and get things done without any hustle. Not only this just like the passenger side display in front this one will provide you all basic information like the speed, distance, time etc. Joining this entire set-up you have a detachable touch command tablet on center console as well. This means with BMW Vision Future Luxury Concept 2014 you get lot of space to sit and work or enjoy without getting bothered. The exterior of BMW Vision Future Luxury Concept 2014 is undoubtedly a futuristic approach of BMW, featuring their future design language. Starting with the front fascia you have twin kidney grille making their way to bumper and sitting amidst headlamps featuring Laser Light technology. 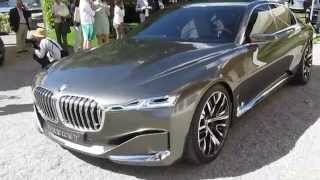 Front apron gets more angular touch and thus the entire face of BMW Vision Future Luxury Concept 2014 looks remarkable stunning with its design. Moving towards the rear fascia, first thing you’ll notice will be the organic LED taillights while the bumper gets a tall position. In all the rear end of BMW Vision Future Luxury Concept 2014 looks wide and aggressive maintaining the smoothness through its high-end materials and polishing. 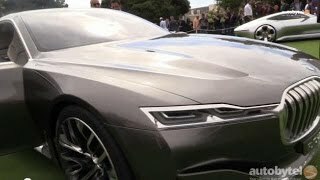 BMW didn’t share any information in context to the engine beneath the hood of BMW Vision Future Luxury Concept or the top speed and power output of BMW Vision Future Luxury Concept 2014. However expecting something at the edge of medium and high in terms of engine won’t be wrong because as we can see that company is much concentrated upon providing a lightweight model with lot of space and technology inside.